Posted by Mark in Travel. I’m spending a few days in San Diego at the National Environmental Workshop. It’s my first time in San Diego, so here are some touristy photos to make the family jealous! I’m staying at the Hotel Bahia–the conference is here, so I just have to walk across the parking lot. … and the boat rental–including some windsurfers! The hotel has some pet seals in a pool (the hotel information book says they were rescued after being beached). Most of my meetings have been aboard this paddle boat. 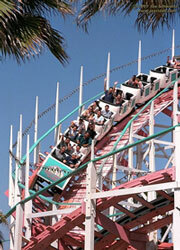 Belmont Park is an amusement park within eyeshot of the hotel. It’s about five blocks to the Strand, the main beach (it’s spring break, so there are lots of girls on the beach, but I didn’t want to creep them out by being an old man in long shirt and pants on the beach taking pictures of them).